Check your tire pressure. Tennessee may not get a lot of snow, but winter temperatures can change significantly. As the temperature fluctuates, tire pressure can change too. Underinflated tires can reduce your mileage by .3 percent. On the other hand, keeping your tires properly inflated can increase your gas mileage by about 3.3 percent. Have a tune up if you’re taking a long trip. Getting your oil changed, tires rotated and everything looked over might cost a bit up front, but you can relax knowing things are in order. Even if you do have a roadside assistance subscription, you may end up waiting longer than usual on busy travel days if you are stranded. Roadside assistance and tow trucks can also be expensive, but being stranded can ruin your plans and create extra costs, especially if it makes you miss a flight. If you don’t need a full tune-up, at least check the condition of your battery and tires before heading out. Blown tires, flats, and dead batteries are some of the most common reasons for getting stranded. Make sure you bring your spare set of keys. Calling a locksmith can cost up to $60 or more. If you’re far from home it’s not really possible to have someone run and get your spare keys. Avoid traveling through Nashville and other busy cities at peak times. Sitting in stop and go traffic can take a major toll on your fuel economy. 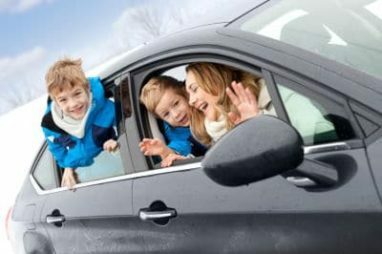 Keep in mind that many people travel the day before a holiday so they can make it to their destination ahead of time. However, traffic will typically be much lighter on actual holidays. Don’t idle to warm up your car. Modern engines are efficient enough to drive right after starting. Let your engine run just long enough for the RPM fall into its normal idling speed, which should take no longer than 30 seconds even in cold weather. Your engine will warm up much faster when you’re driving than just idling. Plus, idling can waste up to a quart of gas every 15 minutes. Avoid high speeds and angry driving. The stress of holiday driving might put you in a bad mood, but it’s best to calm down while driving. Aggressive driving such as speeding, accelerating quickly and braking suddenly can reduce your gas mileage by 33 percent on the highway and 5 percent in town. Pack light. Having more suitcases means driving with a heavier load, which leads to worse gas mileage. According to the EPA, you can improve your fuel economy by 1 to 2 percent for every 100 pounds of excess items you remove from your vehicle. Keep in mind that you also might receive large or heavy things as gifts and you’ll want to save room for them in the car. We offer free pick-up or towing, and you can get a tax deduction just in time for the New Year. Any donation we receive online before 11:59 p.m. on Dec. 31 will count for this year’s taxes. On top of a tax deduction, our program also benefits local children’s hospitals and charities in Tennessee!